Fresh off the success of 2014’s Maleficent, Disney offers another live-action version of a classic animated tale via 2015’s Cinderella. A young girl named Ella (Eloise Webb) lives an idyllic life with her merchant father (Ben Chaplin) and doting mother (Hayley Atwell). Ella’s life takes a turn for the worse when her mother suddenly turns ill and dies. Years later, a grown-up Ella’s (Lily James) father decides to remarry. He weds Lady Tremaine (Cate Blanchett), a union that also brings her daughters Drisella (Sophie McShera) and Anastasia (Holliday Granger) into the family. This doesn’t go well for Ella. Though Ella pledged to her mother to always be happy and kind, Lady Tremaine and her daughters prefer to go in the other direction, as they seem selfish and vindictive. Because her father leaves her alone during frequent business travels, she finds it more difficult to maintain her eternal sense of optimism. Matters get even worse when her father dies suddenly. This leaves Ella – redubbed “Cinderella” by her stepsisters when she sports ash on her face – without any friends or support beyond the animals who live with her in the attic. We follow her path as she works toward better times, especially after she meets a prince (Richard Madden) – and later when she encounters her Fairy Godmother (Helena Bonham Carter). Other live-action fairy tales have taken various degrees of liberties with the source. 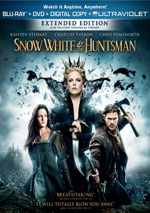 Snow White and the Huntsman and Hansel and Gretel: Witch Hunters went with strong action orientations, and that’s the general tendency of these adaptations - Maleficent included. 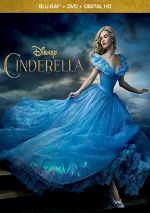 Like 2012’s Mirror Mirror, the live-action Cinderella tries much harder to maintain the tone and story of the Disney animated flicks. Director Kenneth Branagh resists virtually all temptations to give the film a “modern feel”. This means no rapid-fire editing and no flashy cinematography. Outside of the movie’s computer-generated imagery, this Cinderella could’ve been made 50 years ago. And I regard that as a good thing. While his Cinderella boasts a throwback feel, Branagh doesn’t make something that seems stodgy or old. Instead, Branagh gives the film the sense of a classic story that suits it. It helps that the 2015 Cinderella gives its lead more of a personality, though that’s not a big challenge given what a dud the original Cindy was. As much as I enjoy classic Disney animation, many of those films’ lead characters were dishwater dull, and that was the case both for Cinderella and the Prince. They were one-dimensional archetypes without much to make them charming. While the 2015 film doesn’t make Ella or Prince Kit especially dynamic, at least they manage some personality traits. Ella gets to demonstrate attributes other than bland kindness, and Kit has a bit of attitude himself. The animated version worked much better in terms of its supporting characters, though, as they offered virtually all of its entertainment value. The live-action take loses some of that via its use of animals, as its critters – especially the mice – don’t play the same way. I guess it’s good the 2015 film doesn’t offer talking animals, but this does mean we don’t enjoy Jacques, Gus-Gus and the others as much. Blanchett digs into Lady Tremaine with gusto, though ironically, her performance seems cartoonier than what we found in the animated version. The 1950 Lady Tremaine may be Disney’s scariest villain, and as voice-acted by Eleanor Audley, she was a cruel, terrifying creation. Blanchett’s Tremaine lacks the same bite, which is good and bad. Actually, it’s probably a smart choice as I don’t think Blanchett could match the quiet ferocity of Audley’s Tremaine. Still, Blanchett gives the character good life, and the 2015 flick manages to humanize her a bit. We see her pain when she learns that Ella’s father remained devoted to his late wife even after he married Lady Tremaine. Blanchett’s Lady isn’t as impressive as Audley’s, but she does well, and I like the ways the film updates the role. Carter’s Fairy Godmother offers another enjoyable creation. She doesn’t get a ton of screen time, but she provides a delightful turn. With just the right splash of whimsy, Carter brings life to the part. Really, the only negative I find here comes from the movie’s dodgy CG. The various animals never look particularly convincing, and they can occasionally turn into a distraction. But not a fatal one. Do I like the live-action Cinderella as much as the 1950 animated version? No, but it works much better than expected and turns into a delightful fable of its own. 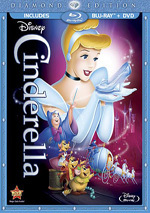 Cinderella appears in an aspect ratio of approximately 2.39:1 on this Blu-ray Disc. This became a satisfying image. For the most part, sharpness worked well. A few interiors showed a smidgen of softness, but those instances remained infrequent. Instead, the majority of the flick offered fine clarity and delineation. I saw no shimmering or jaggies, and edge haloes failed to appear. Print flaws also stayed away from this clean presentation. As for the palette, it showed a teal tendency, but the different settings allowed for a variety of other hues as well. These came across as peppy and vivid. Blacks looked dark and deep, and low-light shots seemed smooth and clear. I felt pleased with the transfer. In terms of the film’s DTS-HD MA 7.1 soundtrack, it opened up matters on occasion. Probably the showiest elements popped up during the magical Fairy Godmother sequence, as her actions used the different channels in an engaging, dynamic manner. Audio quality appeared good. Speech remained distinctive and concise, and music sounded robust and full. Effects demonstrated nice clarity and showed solid oomph when necessary. I felt reasonably pleased with the soundtrack. A mix of extras flesh out the set. A Fairy Tale Comes to Life runs nine minutes, 23 seconds and offers notes from director Kenneth Branagh, producers David Barron, Allison Shearmur and Simon Kinburg, screenwriter Chris Weitz, Philips Corporate Allliances VP Marty Gordon, and actors Cate Blanchett, Lily James, Stellan Skarsgard, Richard Madden, Sophie McShera, Holliday Grainger, and Helena Bonham Carter. The featurette looks at the source material and the new film’s attempts to update the story as well as costumes, cast, characters and performances. “Tale” offers a reasonably interesting little discussion. During the two-minute, 39-second Costume Test Fun, we get a look at that footage. We see some of the actors in test footage meant to give impressions of their various outfits. It could use narration but it has some charm to it. Staging the Ball goes for 11 minutes, 27 seconds and features Branagh, James, Skarsgard, Madden, Grainger, Blanchett, Barron, McShera, costume designer Sandy Powell, production designer Dante Ferretti, makeup designer Naomi Donne, hair designer Carol Hemming, production franchise supervisor Anna Hall, choreographer Rob Ashford, orchestra conductor Hywel Davies, and actors Nonso Anozie, I-San Tiaw, Michael Henry and Alexandra Ross. This piece looks at all the elements that went into the creation of the film’s signature ballroom sequence. We find a quick but informative featurette. Called “Ella’s Childhood”, an Alternative Opening lasts three minutes, two seconds. After an intro from Branagh, we see an extended view of Ella as a youngster. It doesn’t really add much. Ella’s Furry Friends takes up three minutes, 43 seconds with notes from Branagh, James, animal trainer Guillaume Grange and head animal trainer Julie Tottman. As expected, it tells us about the animals used during the shoot. The show gives us some decent thoughts. Finally, we get a new animated short called Frozen Fever. In this seven-minute, 56-second cartoon, we see Elsa’s attempt to give her sister Anna an awesome birthday party. It’s fairly entertaining and earns points due to the return of the movie’s original voice actors. The disc opens with ads for DisneyNature’s Born in China, Inside Out and Tomorrowland. Sneak Peeks adds promos for Disney Parks, Once Upon a Time and DisneyNature’s Monkey Kingdom. No trailer for Cinderella appears here. A second disc provides a DVD Copy of Cinderella. It includes “Ella’s Furry Friends” and Frozen Fever but lacks the other extras. A light, lively version of a classic fairy tale, 2015’s Cinderella gives us a pretty timeless take on the material. It updates the material in a charming manner and becomes enjoyable in its own right. The Blu-ray presents good picture and audio along with some minor supplements. Fans of the 1950 animated film should also enjoy this likeable reworking.